Gannets are interesting birds. They normally breed on islands, but there are a few places where they nest on the mainland instead, and return every year. Muriwai is one of those places; a place of thundering surf, cliffs, and howling wind. When we were there, we had jackets zipped and were leaning into the gale off the Tasman, cold as could be. The birds, instead, looked like they were sunning themselves on a beach, happy as a lark. Um – wrong metaphor. The pictures below show you this Muriwai coast. Part of that wave action is due to the wind, let me tell you. The churn is impressive. third in the second). Each is a separate cliff. There is also some spillage of nests up the side of the headland in the second picture, not shown. Probably from overcrowding, or maybe the nests were cheaper out there. Let me digress and regale you with some gannet lore. They catch fish by diving into the sea and pursuing their prey underwater. They can hit the water at a speed of 60 mph (Ouch for the bird! And for the poor fish, it must seem like you’re being chased by a bird in a porsche). When juvenile birds get kicked out of the nest, it’s a one-shot jump off the cliff. 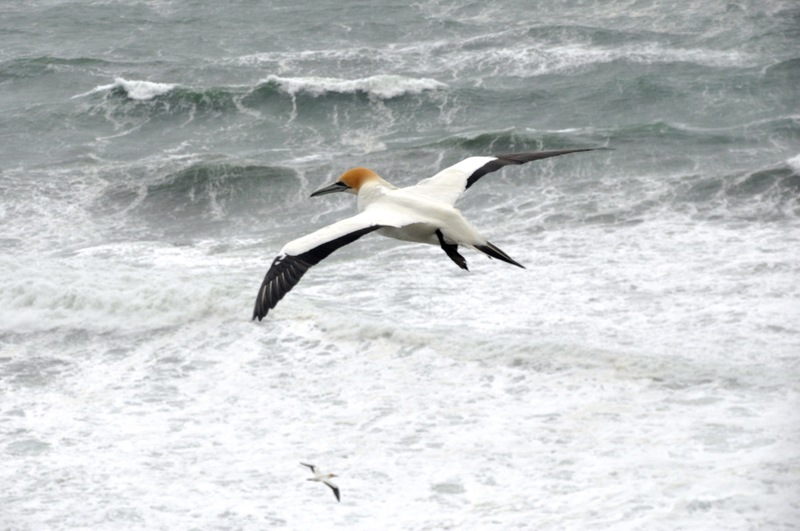 Once airborne, the young gannets leave the colony and cross the Tasman Sea to Australia (about 1500 miles), no one knows why. Two years later, they return for good to secure a nest site at the same colony, home. convivial group down there, as shown above. As mentioned, we watched some take-offs and landings for awhile (a take-off means spreading your wings, and the wind lifts you up…). One landing went awry, and the bird did this ignominious kerplop summersault face plant. Sorry I missed a picture of that! Expecting some Bronx cheers from the neighbors, we were surprised at zero reaction. The bird gets up unruffled and steps over to a nearby bird, and they proceed to smooch and snuggle! I can imagine her saying “Oh honey, that landing was soooo much better than the last”. I’m sure that’s what Ginger would have said. Pictures of the “Honey I’m home” event below. Well, all for now. We’re off tomorrow to one of those predator-free islands to see (hopefully) some rare birds. Next post maybe I’ll show you some bird pictures?